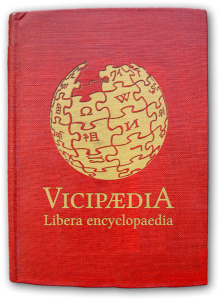 There are a lot of nerds on the Internet (including me), but if I had to pick one of the nerdiest websites of all, it would have to be the Latin Wikipedia. Even though I don’t speak Latin, I like to knock around on the Latin Wikipedia. I like to browse modern topics just to see how the editors latinize words and names that didn’t exist back in the days of Rome. Overall, I’ve seen three different methods. Adopt the name without changes: e.g. Barack Obama. Latinize the name while keeping its basic form: e.g. Baracus Obama. I don’t know what’s nerdier, people writing encyclopedia articles in a so-called “dead language”, or people arguing over the exact translation of every word. In any case, I think it’s a magnificent way to bring this ancient tongue into the modern world. And since Latin is still used for scientific nomenclature, these silly arguments between Wikipedia editors may end up having real-world ramifications. When I say that Latin Wikipedia is one of the nerdiest sites on the Internet, I mean it as a compliment. I consider myself a nerd after all. And while I don’t speak or write Latin, I’m glad that there are people online keeping the language of the ancients alive and well.